← Get ready to Shake it Shake it with Meghan Trainor in Singapore this April! Melodic Punk Rock Band from South Korea, …Whatever That Means, will be performing in Singapore next Saturday. Formed in 2009, Jeff Moses (Guitar/Vocals), Trash Yang Moses (Bass/Vocals), Bialy Mlody (Guitar/Vocals) and Mizno Cockroach (Drums) has performed in Korea, Malaysia and the United States. Described as the pop-punk face of the Korean music scene by the Alternative Press magazine (USA), they have since released two albums and digital single. Now, they are currently busy writing their next release while touring and planning another US tour. 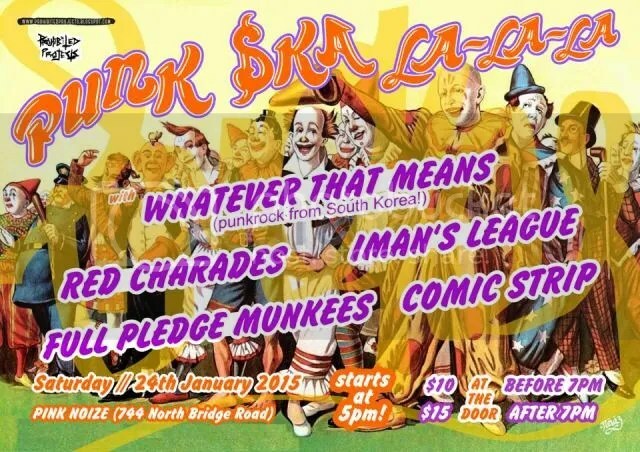 If you would like to witness the pop-punk face of the Korean music playing alongside with Comic Strip, The Full Pledge Munkees, Iman’s League, Red Charades, Lupa & The Superstars and Rubix, be sure to catch them live on January 24! For more information, do follow the band on Facebook and Twitter!